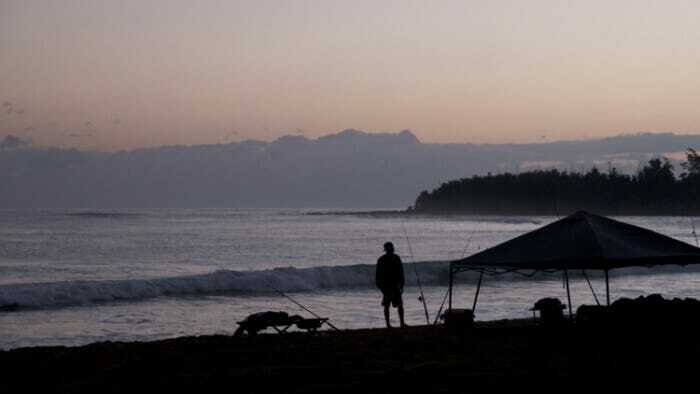 Sunrise at the beach- Kumu Camp. I was there for two weeks and absolutely loved it. But I must say, it’s expensive. I did it on the cheap. 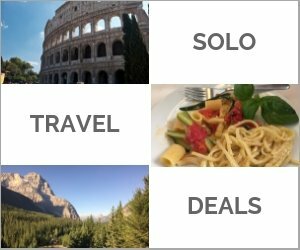 I stayed in a hostel and ate inexpensively for the most part and yet still, it was expensive. You can see what I spent here: Solo in Kauai: What I Spent. I think this is a destination that requires a post in our 32 Free and Low-Cost Tips series. We have them for London, Paris, New York, Sydney… and now here’s our tips for budget Kauai. Sunrise/Sunsets on the cheap. I saw my first Kauai sunrise through the window at the foot of my hostel bed. I woke up. Sat up. And there it was. Taking in the sunrises and sunsets are essential to any trip to Kauai. You can enjoy them on a wild beach or take them in at a resort lounge such as the St. Regis in Princeville where they have a ritual of sabering a bottle of champagne at sunset. Take long oceanfront walks. It’s an island. It’s an island with one main road that follows the coast for much of it. A long ocean-front walk beckons. It’s another essential experience in Kauai. Be smart about the sun. The sun is strong in Kauai so wear a hat, protective clothing and sunscreen to avoid burns and worse in the long term. Use an umbrella to create shade rather than a coconut tree loaded with coconuts. They too can do serious damage if you’re hit on the head by one falling from such high heights. Find free WiFi. On a more practical note, you may be in need of WiFi. 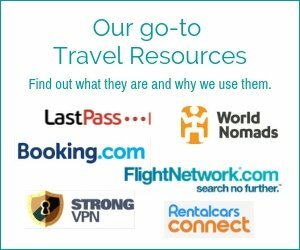 It may be free at your resort, hotel or hostel but once you’ve headed out for the day it’s difficult to find. Fortunately, like almost everywhere else in the world, there’s Starbucks. They are a reliable source for free WiFi and for outlets for charging your technology. There’s more free stuff in the Things To Do section below. Waimea Canyon is considered the Grand Canyon of the Pacific. It’s accessed from the west side of Kauai. Grand Canyon of the Pacific – Waimea Canyon is on the west side of the island and a long way from where I stayed in Kapaa but it was so worth the drive that I went twice when I was there. The views are stunning. They were all I needed on my first visit. The second time I went I hiked. Read Another Hiking Humiliation and Then… Redemption. 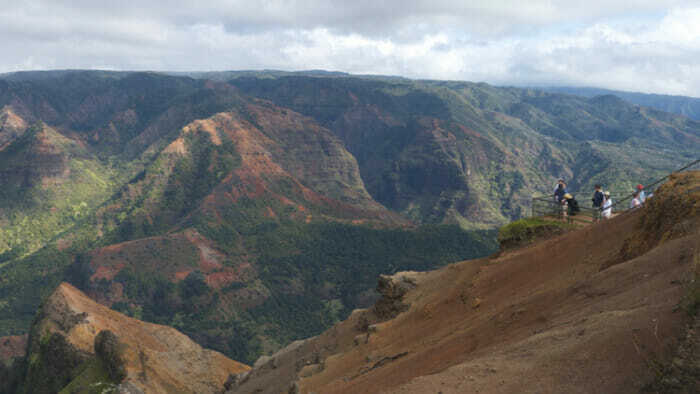 Hiking – From easy to challenging, there’s hiking for every level in Kauai. I did a number of hikes beyond the Waimea Canyon. I found this site to be the most helpful in planning my hikes. I particularly like the kayak/hike to the secret falls. See below for more details on this. Mahaulepu Coastal Trail was probably the easiest and one of the most beautiful hikes I did. Water fun – Be careful. The waters around Kauai can be dangerous and I saw signs advising people to only swim, surf, snorkel at beaches that have lifeguards. Apparently one or two visitors drown every month. For water sport rentals try Kapaa Beach Shop. Go to the Beach. I particularly liked Anini and Anahola both of which have lifeguards. I found Poipu, a very popular destination, to be a little too crowded for my liking. 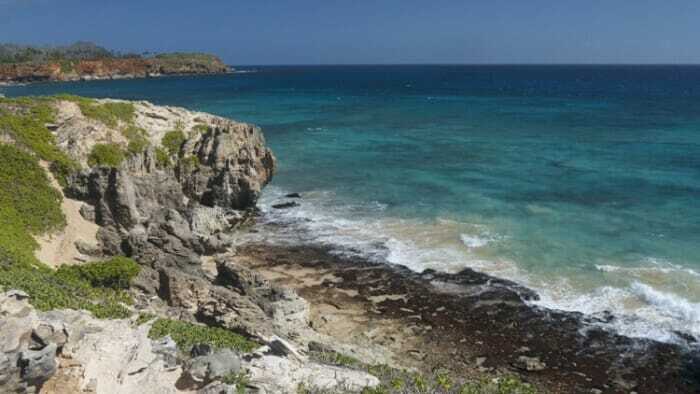 Snorkeling – Check this list for safe snorkeling at beaches tended by lifeguards. Kayaking – Kayaking is very popular on the Wailua River. Try to go on a Sunday as, with the exception of Smith Tours, most companies don’t operate on Sundays so the river will be quiet. Kayak to the start of the trail to the Secret Falls. The hike to the falls is about an hour. Go in the morning and you’ll have more time in that gorgeous forest without a lot of other tourists. Bring a picnic lunch. Of the shops I checked out, this one at the northern edge of Kapaa on the main highway had the best prices. Kapaa Beach Shop. Farmers’ markets. There’s a farmer’s market somewhere on the island just about every day of the week. Check them out for local food and crafts. Free music – Yes, it will cost you the price of a beer but Trees Lounge in Kapaa is the place that a few locals recommended for live music. I went. It’s not fancy and was described (accurately I’d say) as a semi-dive on Trip Advisor. It’s a bit dark and very basic but good music. Mead tasting. It’s not your typical tourist thing to do. 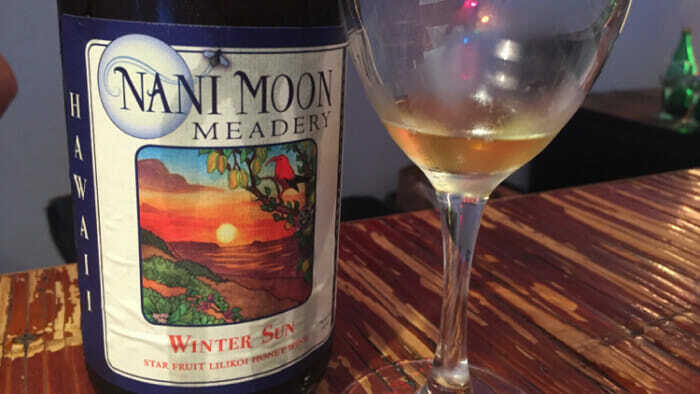 Try the mead tasting at Nani Moon across the way from Kauai Photo Tours office. Take in a festival. If you’re lucky enough to have the dates of your trip coincide with a local festival you’ll get a better sense of the real Kauai. Here’s a link to Kauai special events. Kīlauea Lighthouse was built in 1912. 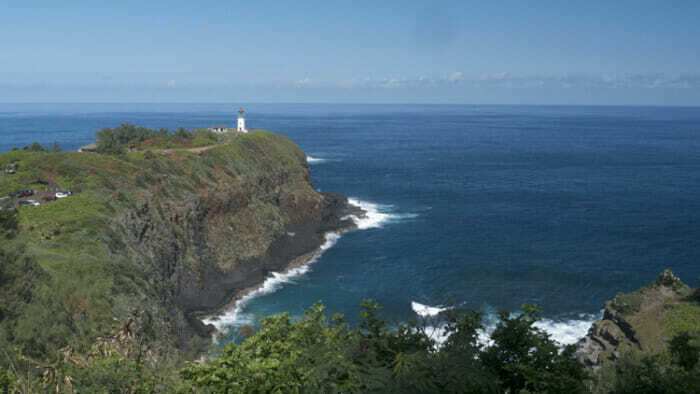 Kilauea Lighthouse – Also from Peggy… “The second thing not to miss is the Kilauea lighthouse as I am a birder and this is prime area for seeing red and blue-footed Boobies. Neither of these two activities cost money. 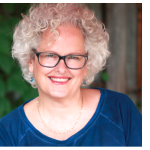 Peggy’s splurge recommendations: I do recommend two things that cost money but are worth it– a helicopter flight over the island (you only need to do this once during your lifetime) and lunch or tea at the St. Regis in Hanalei. The food is farm to table, the hotel is posh and the view of Hanalei Bay is unrivaled. And one thing not to do. I’d advise against going to the South Pacific Dinner show. It’s not cheap (about $100), the buffet is only ok and the musical itself is high school quality. I love going to theater as I travel so I thought I’d try it out. I was quite disappointed. 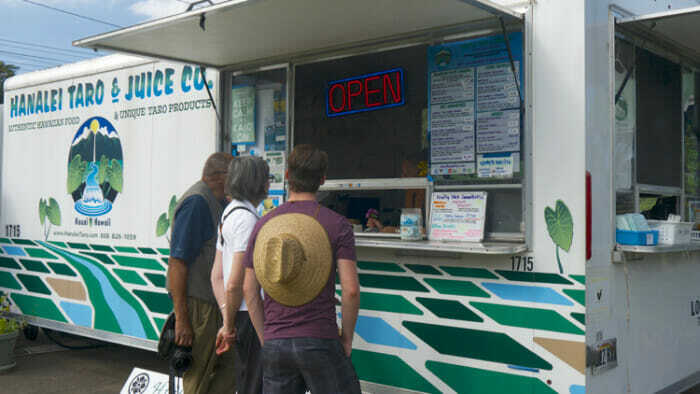 The food trucks are your best budget food option in Kauai. Food is expensive in Kauai. But for good quality at a reasonable price you’re best to go to one of the food trucks. As I was told by a local, they are where the locals eat and if a truck is not up to snuff, it won’t last long. 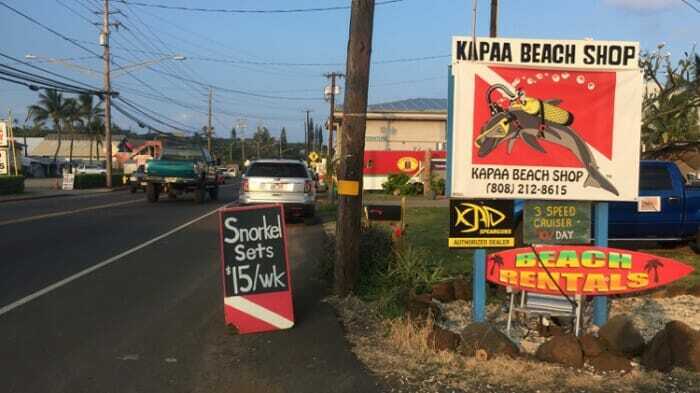 Small Town Coffee, Kapaa (truck) – Located right across from Kauai Beach House Hostel and on the main drag at the north end of Kapaa Small Town Coffee serves up great coffee and baked goods. They also have Anahola Granola. It’s delicious and I had it for breakfast as often as I could. Safeway – You’ll be doing some hiking and picnicking. Or maybe you’ll be eating in. Whatever, Safeway has a great deal at the deli counter. You can get one main and two sides for $8. Also, they have what they call their “Club” prices on specials throughout the store. If you’re not a club member you can always ask someone in line to swipe their card for you if you have club items. I did this twice and saved over $10 by doing so. Both times the person was happy to oblige. Bubba Burgers, Kapaa, Hanalei and Poipu. If the veggie burger is good (I enjoyed it) I think it bodes well for the beef burgers being exceptional. And that’s the reputation Bubba Burgers with its three locations has. They serve fresh ground Kauai “Grass-Fed” Beef. The Mermaid’s Cafe, Kapaa (truck/shack on main street) This is a little anomaly on the main street of Kauai. Squeezed between buildings with just a couple of picnic tables out front for patrons, you order at the window and wait for you meal. I really enjoyed their specialty, the Ahi Nori Wrap at $13.95. Hanalei Taro and Juice Company (truck) – I enjoyed a fine lunch here when I was on a day-long photography tour. Everyone enjoyed the food – a lot! Being pescatarian I had the taro burger and, to be honest, I preferred the taro burger at Bubba Burgers over this one. Art Cafe Hemmingway. I splurged for one meal. I had scallops on angel hair pasta. The flavor was delicate and delicious however the portions were very small. I believe there were five scallops on my plate but it seemed as though some had been cut in half horizontally so that one scallop could appear as two on the plate. Still, I thoroughly enjoyed a meal in an upscale restaurant for a change. This is the common area of the Kauai Beach House Hostel. It’s difficult to give you a sense of what it was like. This area is covered though the sides are open but protected by trees. To see more photos read my post on the various places I stayed in Kauai. Hostels. 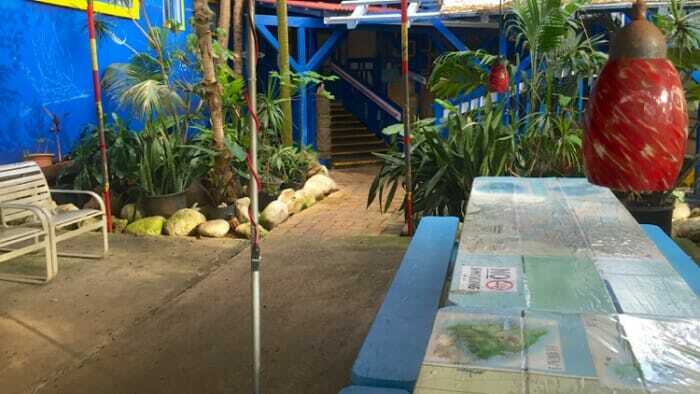 From my research and what from I learned from others there are only two hostels on the island. I stayed at the Kauai Beach House Hostel which has ocean views. If that’s busy there’s also Honuea Hostel a short, walkable distance away. I checked out the latter and I wasn’t as impressed and before I got there the reviews were not good. However as I look at them now they seem to be fine. As always, do your research and make your own choice. YMCA camp. 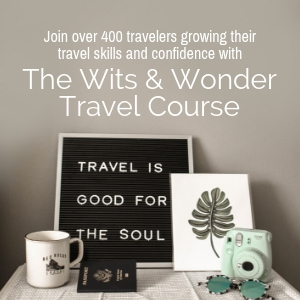 This information was sent by Solo Traveler reader, Holly. “I read about the YMCA camp in a tourist publication. The cottage was already booked by a couple from BC so we stayed in the dorm for $20 At the time the cottage was $35. They provide the linens for the cottage but not the dorms. The road in is a little rugged but the grounds are lovely. It’s at the end of the road to the Waimea Canyon. Princeville. Princeville is an area at the north end of Kauai that includes high-end hotels and resorts. There are golf courses, restaurants and the like there. 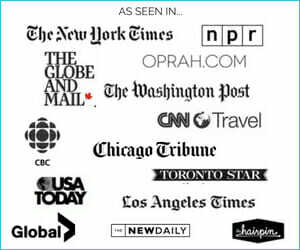 It is possible to get a good deal here by booking through a site like VRBO . I considered this option but I don’t golf and I was looking for something less resort-like. Yurts. I stayed for a few nights at Kumu Camp which is a campground of yurts (tents on platforms) that is located on a spectacular beach. You can read more about it in my post on accommodation in Kauai. 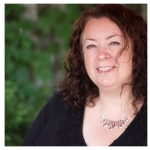 There are also individuals offering yurts to rent on airbnb. 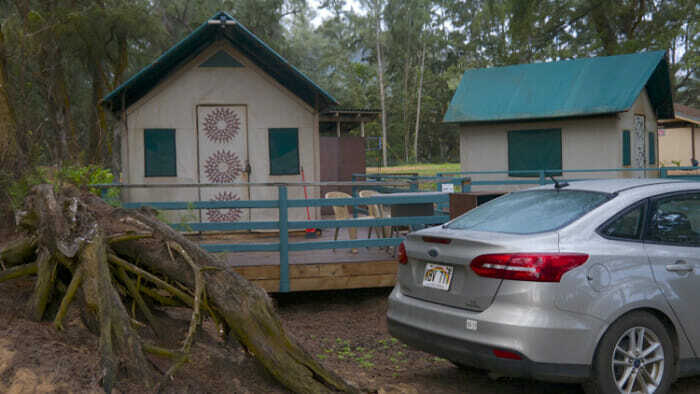 My rented car in front of my yurt at Kumu Camp in Anahola. Rent a Car – For $261.23 I rented a car for two weeks. This could get me everywhere, including cheap places to stay and eat, free festivals and the like. I believe it paid for itself. BTW, I didn’t get insurance from the rental company. Instead I relied on my credit card insurance (the card I used to pay for the rental) and it worked. I had a fender-bender and it was covered without a hassle at all. Check the fine print of your credit card insurance because this can save you a bundle. The Local bus – The bus is an option though they aren’t frequent and it will reduce how much you’re able to do in your time there and where you can do. It costs $2 (exact fare) and it has bike racks on the front. The bus stops at every stop so don’t pull the cord because it’s an emergency cord, not there to notify the driver that you want to get off. Rent a bike – The highway in Kauai is very hilly and much of it doesn’t have a decent shoulder so I don’t recommend biking as your main source of transportation. However, renting a bike in Kapaa where there is a bike path about 8 miles long is fine. Rent a bike in town and its $10 for 3 hours. Rent it about a half mile further north at Kapaa Beach Shop and and it’s $10 for the day. A combination. If you can’t get around to most places you want to go with the local bus you could choose to take a day tour or two to get to the more challenging places like the Waimea Canyon. Just search Kauai tours on Viator and a variety of options will show up. 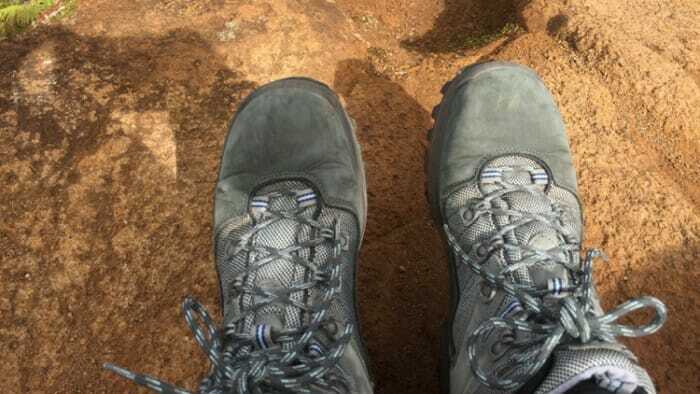 I love my Berghaus hiking boots. I bought them in the Lake District of England. I walked out of the store and started hiking in them and they never gave me a problem.